The book offers a foreword by Harrison Ford with a picture of Ford in his Kenmore rebuilt Beaver. 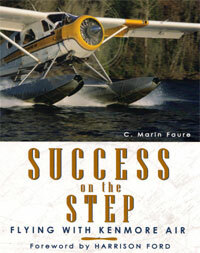 Authored by Marin Faure, Success on the Step is the incredible and beautifully written story of Kenmore Air, the company founded 55 years ago by Bob Munro. "Only now, instead of a one-plane operation based in a mud hole, they [are] running the most successful seaplane airline in the world." islands of the Pacific Northwest. It is also a story of how to succeed in business. For Kenmore Air's real triumph has been demonstrating that the only truly reliable ingredients for success are honesty, integrity, and respect. This well-written and often humorous account will keep you on the edge of your chair. It's a great adventure story and a great way to learn how a start-up company founded on a shoestring budget has become the well-respected leader in the seaplane industry. "It didn't take me long to realize I was dealing with a very special company. My plane was doing the phoenix thing out in the shop, rising from the ashes of years of mistreatment and neglect to become a stunning example of the breed. But there's a lot more to Kenmore than resurrecting de Havilland Beavers."